Newly-elected Mayor Joe Bagby resigned a few hours before the first regular meeting of the new Board of Trustees on January 7. The resignation was not announced at the meeting because an effort was underway to persuade him to reconsider his decision. Mayor Pro Tem Tom Bender is performing the mayoral duties until a new mayor is appointed. In his resignation letter, Bagby cites "safety concerns for my wife, myself, my home and property." He states that he was informed of possible threats to his family and home. Mayor Bagby submitted his letter of resignation to Town Clerk Tori McMechan and included two emails: an anonymous email signed by the "Silent Majority", and an email from the town clerk's husband, James McMechan. Bagby was elected by 63% of the voters in the December 15 recall election, defeating mayoral candidate Gary Stuart by a large margin. Former Mayor Jeffrey Pigue was removed from office after receiving only five votes for retention (out of 134 votes cast). The Board of Trustees will discuss replacing Bagby at its special meeting on Thursday, January 14, at 7:00 PM. See the meeting agenda here. 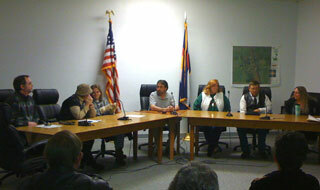 At a special meeting held tonight, the town clerk swore in newly-elected Mayor Joe Bagby and four trustees. Trustees Jenny Johnson and Joyce Taylor were also sworn in, even though they retained their previously-held seats during the recall election and therefore were never out of office. As the mayor and each trustee finished their oath of office, the audience erupted with rousing applause. The new board then took up the matter of appointing a mayor pro tem. Tom Bender was the only nominee, and he was approved unanimously with no discussion. No other business was conducted. The special meeting of the Board of Trustees scheduled for this evening was cancelled late in the day after Mayor Joe Bagby and a few trustees were advised by an investigator for the Weld County District Attorney to not hold the meeting. The investigator explained that he had had conversations with members of the "opposition" who were extremely upset about the recent recall election and subsequent swearing in of new trustees. Bagby and the others were told that the D.A. 's office was concerned for the safety of residents and town officials, and that the county sheriff's office had been placed on high-alert. According to reports, newly-elected Mayor Joe Bagby and Trustees Tom Bender, Patti Norris, and Wilbur Schooler were sworn in at approximately 3:30 PM today by Severance Judge Keith McIntyre. Trustee-elect Bobbie Crosby was not sworn in. Town Clerk Tori McMechan had earlier in the day failed to make out and transmit to winning candidates the certificates of election required under state statutes. The certificates are to be "immediately" made out and transmitted "without delay". (C.R.S. 31-10-1205) Furthermore, McMechan had refused to swear in the new officers until after the statutory deadline for requesting and conducting a vote recount had passed. Shall Mayor Jeffrey Pigue be recalled? Shall Trustee Christy Alexander be recalled? Shall Trustee Karen Burd be recalled? Shall Trustee Jenny Johnson be recalled? Shall Trustee Jack Smith be recalled? Shall Trustee Joyce Taylor be recalled? Who shall fill the vacancy on the Board of Trustees? Thanks to election judges Tracy Sandmann, Toots Miller, and Howard Mike Williams. Anonymous letter sent by "The Silent Majority" to residents of Nunn, postmarked December 11, 2009 (PDF 378 KB, 1 page) The anonymous author urges voters to vote for a slate including current trustees and candidates: Gary Stuart, Christy Alexander, Jack Smith, Bobbie Crosby, James McMechan (husband of Town Clerk Tori McMechan), Justin Cottrell, and Regina Rosales-Pigue (wife of Mayor Jeffrey Pigue). The author's support for mayoral candidate Gary Stuart to replace Mayor Jeffrey Pigue is noteworthy; a July letter from the "Silent Majority" praised Pigue. Order Affirming the Findings and Order of the Hearing Officer, Weld County District Court 19th Judicial District (PDF 333 KB, 8 pages) - Filed November 4, 2009, Plaintiff: Christy Alexander, Defendant: Tori McMechan, in her official capacity as Town Clerk for the Town of Nunn, Intervenor: Carol Holwerda, as chairperson of the circulators of the challenged recall petition. On September 29, 2009, Mayor Pro Tem Christy Alexander filed a lawsuit against Nunn Town Clerk Tori McMechan alleging that McMechan violated state statutes by improperly finding that recall petitions against her, Mayor Jeff Pigue, and Trustee Jack Smith were sufficient. During a November 2 hearing in District Court, Judge James Hartmann ruled that since Alexander was not licensed to practice law in Colorado she had no legal right to represent Pigue and Smith. The judge also noted that Alexander had failed to provide the court with a printed transcript of the petition protest hearing. Judge Hartmann's order concludes that "The Plaintiff (Alexander) has not met her burden to show that the Defendant (McMechan) exceeded her jurisdiction or that she abused her discretion when she determined that the petition to recall the Plaintiff was sufficient." Town Attorney Brittany Scantland had earlier advised the town board to set a recall election date but that Alexander, Pigue, and Smith should be excluded even though the town clerk had found their petitions to be sufficient. After advocating for Alexander, Pigue, and Smith, Scantland then went on to represent the Town of Nunn and McMechan against Alexander's lawsuit at the District Court hearing. The recall election for Alexander, Pigue, Smith, as well as Karen Burd, Joyce Taylor, and Jenny Johnson has been set for December 15. Anonymous letter sent by "The Silent Majority" to residents of Nunn, postmarked July 29, 2009 (PDF 360 KB, 2 pages) The anonymous author accuses Trustees Jenny Johnson, Karen Burd, and Joyce Taylor of corruption, and encourages residents to talk to Mayor Jeffrey Pigue, Mayor Pro Tem Christy Alexander, and Trustee Jack Smith. The author accuses the three trustees of committing "unrighteous dominion", a Mormon principle that means an abuse of power. Ironically, Mormon teachings caution against demeaning or diminishing others, and urge followers to look for the best in others instead of attributing bad motives.